The leaves are just starting to change colour and fall, but the Christmas puddings are on the shelves at the shops and it’s just a matter of time before the first pre-Christmas sales begin. Over the past few years my sister, mother and I have been giving each other handmade gifts at Christmas. Mom makes wonderful hooked rugs and cushions and my sister has made us beautiful felted stockings, knitted scarves and sweaters. I’ve woven wraps for my mom and made yarn and soap for my sister. This year I want to make a gift for everyone in my family–luckily we are a small group! The problem has been coming up with something different and useful for my dad and husband. I did a search for DIY/handmade gifts for men and the options some of the ideas were hilarious–a bouquet of bacon, flavoured toothpicks and “restore an heirloom axe“. Also apparently beard oil is The Thing, but we are a beardless bunch. Not all the ideas I saw were totally crazy and here are some that aren’t beard oil, bacon, scarves or hats. Man bag: I was telling Sal about this tote bag my dad uses as a sort of briefcase. It is a freebie from a pharmaceutical company he was given for judging a science fair. It is ripe for replacement. I found this utility tote pattern by Don Morin. It’s perfect, and as Sal says all I have to do is stencil some drug logos on it. There are loads of free patterns for messenger bags out there both knitted, felted and sewn. 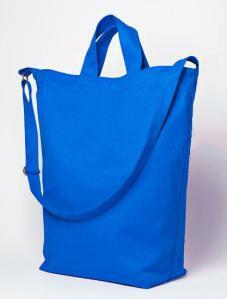 How about upcycling some jeans or natural dyeing or printing on some organic hemp fabric then sewing it up into a bag? There are so many ways to use your fiber arts and sewing skills for a messenger bag. Sweatshirt: I love this Finlayson Sweater from Thread Theory. I’m going to make this up for my husband. I’ve got some jersey fabric in my stash. There are some nice organic jerseys available now that could be naturally dyed. Or maybe you have some handwoven you could use. Here’s a link to our guide to using handwoven for sewing projects. 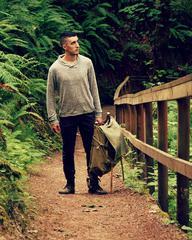 For further inspiration: Independent designers have some beautiful sewing patterns for men now. Check out Walden, Thread Theory, Hot Patterns and Merchant and Mills. Man scrub: Men like a good scrub just as much as women. Last year I wove washclothes using Syne Mitchell’s Loop-pile washcloth pattern from her book Inventive Weaving on a Little Loom. I used cotton, but she has a hemp/aloo version which would be a great alternative to those plastic shower poufs. Once this one has outlived its usefulness you can throw it on the compost pile and make another one. There are knit and crochet options. Here’s a shower mitt from yarnspirations which could be knitted in hemp or cotton. For crocheters, here’s a loofah. Do you want to make homemade soap? You should. Look no further than Humblebee & Me. Loads of idea not just for soap, but things like DIY tiger balm, after shave and lip balm. This woman is a genius. Slippers: Slippers are a classic dad gift. There are so many patterns to choose from including: Martha Stewart’s, Drops’ felted and these gorgeous ones from Arne & Carlos. There are some upcycling possibilities here. Why not use old sweaters, felt them and sew them into slippers. You could sew a bit of old denim on the bottom to make them sturdier. Dice bag: Do you have any gamers in your life? How about a dice bag? Here’s a knitted one–twelve – sided no less! You could run up one on the sewing machine maybe with Doctor Who fabric? Or Space Cats!!! Mug cosy: Another classic. Again there are loads of patterns on Ravelry. But you could easily use woven fabric or even sew them with your favourite novelty fabric. Free patterns galore online. Other ideas might be making a belt on an inkle loom or knitting a pair of socks. One last idea which is not sewing/fiber arts related, but I think is a great idea for a Fathers Day present–homemade barbecue rub. My dad would definitely use this! Thanks Martha. Last year Sal wrote a post on gifts for the fiberista. Lots of good ideas here. Please let us know your ideas for making for men. These are all great ideas, but I think maybe you could re-title it “Gift Ideas for People Who Don’t Like Shawls and You’ve Already Knit Them Enough Hats and Scarves”, because I love all of these! It is so true about hats and scarves. I feel like those and hand warmers are always trotted out as the knitted/crocheted Christmas gifts. I made my dad a scarf a couple of years ago–gorgeous, if I do say so myself–but I doubt it will get much use in California! And I can’t see Bruce wearing hand warmers. Can you? My mom gives me a scarf almost every year. It’s getting ridiculous. I can see Bruce wearing hand warmers if they were appropriately themed…especially if they include those heating packets. Good for watching rugby in the cold. You know, you can seam all those scarves together and make a blanket or a throw. But I’m totally getting you a bouquet of bacon this year! Nothing says “I care” like a bacon bouquet. You’re welcome Marie. I’m a big fan of your site and your recipes!! !